Apple has 48 hours to re-write a statement on its website relating to its design rights dispute with Samsung, UK judges have ruled. Apple was forced on 18 October to publish a message making it clear that Samsung had not infringed the iPad's registered design. However Samsung complained the statement Apple had posted did not comply with the court order. Judges agreed and have told Apple it must be removed within 24 hours. A new, compliant version must then be posted. Michael Beloff QC, representing Apple, told judges that the company had thought that it had complied with the court order. "It's not designed to punish," he said. "It's not designed to make us grovel. The only purpose must be to dispel commercial uncertainty." He asked that the company be given 14 days to post the replacement - but the request was firmly denied. Lord Justice Longmore told Mr Beloff: "We are just amazed that you cannot put the right notice up at the same time as you take the other one down." One of the other judges, Sir Robin Jacob, added: "I would like to see the head of Apple [Tim Cook] make an affidavit about why that is such a technical difficulty for the Apple company." Apple told the BBC it did not want to comment further. 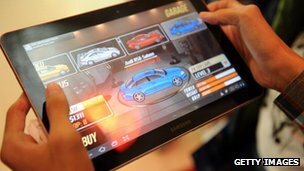 Samsung complained that the notice posted by Apple was "inaccurate and misleading" because it added comments about other rulings in Germany and the US that had gone in the iPad-maker's favour. "This has received enormous publicity and has perpetuated confusion as to Samsung's entitlement to market the Galaxy tablet computers in issue," a Samsung lawyer said in a written statement to judges. "It has created the impression that the UK court is out of step with other courts." The UK's ruling applies to the whole of the EU. The court order is the latest twist in an ongoing legal saga involving the two companies. Apple brought the case to the UK courts, alleging that Samsung's Galaxy Tab 10 had infringed the design of its iPad. But in July, Judge Colin Birss disagreed on the grounds that Samsung's product was not as "cool". His ruling meant that Apple was denied the opportunity to impose a sales ban on Samsung's products. Apple was unsuccessful in appealing the ruling, and was ordered to place a notice on its website, newspapers and magazines explaining that Samsung had not infringed its designs. The intention, judges said, was not to make Apple "grovel", but to remove "commercial uncertainty" surrounding Samsung's products. "A consumer might well think: 'I had better not buy a Samsung - maybe it's illegal and if I buy one it may not be supported'," Sir Robin said. "Apple itself must (having created the confusion) make the position clear: that it acknowledges that the court has decided that that these Samsung products do not infringe its registered design. "The acknowledgement must come from the horse's mouth."